You cant imagine how nice this Hostel is until you get there. To be honest this is one of the best Hostels I have stayed in since I travel. Staff superfriendly and helpful, u can rent bikes for free, everything is super clean, chill out area with Bar comfy and big. There is absolutely no complaints at all. I would definately stay there again!! Best Hostel I've ever been! Everything is fantastic! This was definitely the best hostel i ever visited in japan. 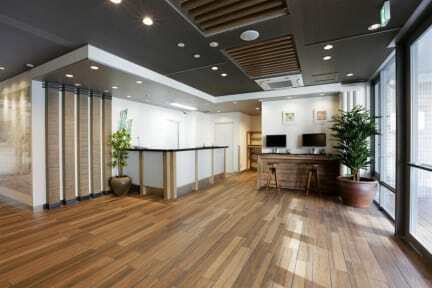 The staff was very friendly, it was located right next to the Kawaramchi Dori and a public bath. Perfect!!! Really cool hostel that offers excellent service. Very friendly staff, clean, outstanding amenities. You can basically rent a lot of extras for free like bikes, additional blankets or pillows, etc. Also the breakfast buffet is really worth it. Located centrally so it's pretty close to the most tourist attractions and from the central area. really nice and comfortable hostel. we had a wonderful stay. Very high-class hostel - almost TOO high-class: I seemed to meet more "posh" travelers, like married couples and families, there's definitely no grungy backpacker atmosphere going on here, this is like the Ritz of Hostels. If that's what you are looking for, great! They have a free (!) bike rental, which is amazing for getting around Kyoto. Breakfast (costs extra) isn't continental, but the curry is AMAZING. The social area is big and very comfy, but it is inexplicably located in the cellar.